The Washington Nationals' mood didn't improve much until the eighth, when Wilmer Difo hit a game-tying homer off the foul pole, and they rallied to beat the Miami Marlins for the 10th consecutive time Saturday, 4-1. MIAMI (AP) — When Bryce Harper struck out in the first inning, he stomped back to the dugout and took three swings at the bat rack , shattering his bat and producing a trio of angry thuds that reverberated in the stands. The Washington Nationals’ mood didn’t improve much until the eighth, when Wilmer Difo hit a game-tying homer off the foul pole, and they rallied to beat the Miami Marlins for the 10th consecutive time Saturday, 4-1. 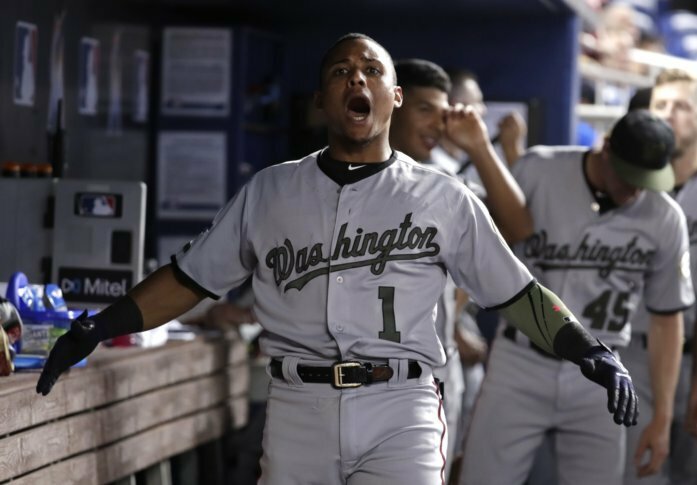 Difo pounded his chest in celebration and skipped into the dugout, and his enthusiasm proved infectious. Justin Miller made his Nationals debut by pitching out of a jam in the bottom of the inning, and Mark Reynolds hit a tiebreaking homer leading off the ninth. Miami’s Wei-Yin Chen took a two-hitter and a 1-0 lead into the eighth. He was especially dominant against Harper, who endured his first four-strikeout game since 2016. Harper has 15 homers, but also a batting average of .231. Chen departed after giving up the one-out homer to Difo, and Reynolds connected against Brad Ziegler (0-4). Pinch-hitter Matt Adams and Trea Turner each added an RBI single in the ninth. Roark allowed four hits and one run in seven innings. Sean Doolittle pitched a perfect ninth for his 11th save and second in as many days. But perhaps the most important pitch thrown by the Nationals came from Miller (1-0). With the score tied, the Marlins had runners at second and third with one out in the eighth, but Miller came on to strike out Starlin Castro on three pitches to end the threat. Miller’s reaction when he walked off the mound? “That was quick,” he said with a laugh. The outing was his first in the big leagues since 2016. Nineteen-year-old Juan Soto had two doubles among the Nationals’ seven hits. They’ve outscored Miami 66-18 during their 10-game winning streak in the series. Reynolds has five homers and a .444 average in 27 at-bats since being called up from Triple-A. The 13-year veteran had a difficult time finding a free agent deal last winter but signed with the Nationals in April. Chen’s 7 1/3-inning outing was his longest in more than a year. He retired 13 in a row during one stretch. Chen is coming back from an elbow ailment that limited him to five starts in 2017. He struggled early this season, but has lowered his ERA from 10.22 to 5.22 by allowing a total of three runs in his past three starts. Ziegler’s ERA rose to 7.54. The groundball pitcher and closer has allowed 32 hits in 22 2/3 innings. Nationals: LHP Matt Grace (left groin) is scheduled to begin a rehab stint when he pitches Monday for Double-A Harrisburg. He may need only one outing before rejoining the Nationals. … RHP Jeremy Hellickson (blister) is expected to make his next start as scheduled Tuesday at Baltimore. RHP Stephen Strasburg (5-4, 3.36) will try to help the Nationals complete a sweep Sunday when he faces RHP Elieser Hernandez (0-1, 2.08).